Director/Producer – Roger Corman, Screenplay – Richard Matheson, Based on the Short Story by Edgar Allan Poe, Cinematography – Floyd Crosby, Music – Les Baxter, Photographic Effects – Ray Mercer, Process Photography – Larry Butler, Special Effects – Pat Dinga, Makeup – Fred Phillips, Production Design – Daniel Haller. Production Company – Alta Vista/AIP. Philip Winthrop travels from Boston to the forbidding Usher family mansion in New England to see his fianc’e Madeleine. He is greeted by her brother Roderick who tells him that Madeleine is ill and he must leave. Winthrop is insistent on seeing her. He learns that both Roderick and Madeleine are infected with the family’s hereditary sickness, which causes a hyper-acuteness of the senses – he must wear slippers because the sound of footfalls are agony to their ears; the light must be kept shaded and the rooms curtained; and all but the most bland of gruel is pain to their taste buds. Madeleine then falls dead and is buried in the family crypt. Just as Winthrop is about to depart, he discovers that Madeleine suffers from catalepsy and has been buried alive. There is a cult that surrounds Roger Corman. There is one part of the cult, a large part fostered by Corman himself, that celebrates Roger Corman the legendary B movie director/producer – Corman who could make a movie in two days (including the time taken to write the script); who could take footage from Russian science-fiction films and write not one but three entire films around it; who could come in under shooting schedule on one film and decide on the spot to shoot another film using the same sets and stars; and who had the unerring eye to pick up and coming talent, including giving early career breaks to names like Jack Nicholson, Ron Howard, Joe Dante, Francis Ford Coppola, Peter Bogdanovich, Peter Fonda, Jonathan Demme and James Cameron among others, because he knew they would work for peanuts to get a toehold in the industry. Corman began producing with the detective film Highway Dragnet (1954) and then started directing with the Western Five Guns West (1955) but it was at AIP (American International Pictures) that he made a name for himself churning out cheap but entertaining B-monster movies and exploitation films. (See the bottom of the page for a list of Roger Corman’s other genre films). There is another half to the Corman legend and that is Roger Corman the serious filmmaker. This is something that began here with The House of Usher. Corman was clearly inspired by the success that England’s Hammer Films had had in the previous few years with their new colour adaptations of The Curse of Frankenstein (1957) and Dracula/The Horror of Dracula (1958). The success of these and the host of other remakes, sequels and original subjects that Hammer would conduct over the next decade inspired a huge interest in Gothic horror. Two months later the same year as The House of Usher, Italian director Mario Bava created a Gothic horror boom in Italy and other continental countries beginning with Black Sunday (1960). For his venture into the Gothic revival, Corman turned to American writer Edgar Allan Poe for his subject matter. Of course, Corman had a problem in persuading AIP producers Samuel Z. Arkoff and James H. Nicholson to allow him to make a film in colour and with a substantially greater budget than the rest of his films up to that point. It was a period when AIP often used to make their monster movies by first coming up with a novelty poster and then creating a film to go with it and Corman had difficulty getting them to understand The House of Usher – he tells an amusing story about how he persuaded them during a pitch session that it would be a film where the house itself was the monster. Even so, Arkoff and Nicholson insisted on paring Edgar Allan Poe’s story title The Fall of the House of Usher down to The House of Usher so that it could fit on a billboard. This was the film that showed that Roger Corman was a serious filmmaker and had his work re-evaluated by critics in the 1960s. After the success of The House of Usher, Corman went on to a series of other Poe based films – Pit and the Pendulum (1961), Premature Burial (1962), Tales of Terror (1962), the Poe-titled but H.P. Lovecraft adapted The Haunted Palace (1963), The Raven (1963), The Masque of the Red Death (1964) and The Tomb of Ligeia (1964). After Corman tired of making Edgar Allan Poe films, AIP carried on their own series of loosely Poe based or related films – The City Under the Sea/War-Gods of the Deep (1965), The Oblong Box (1969), Cry of the Banshee (1970), Murders in the Rue Morgue (1971), even renaming the US release of the historical witch persecution film Matthew Hopkins – Witchfinder General (1968) as The Conqueror Worm, and so on. For the first of his Edgar Allan Poe films, Corman and screenwriter Richard Matheson start with maybe the most famous of Poe’s horror stories, The Fall of the House of Usher (1839). Most of Poe’s horror stories are concentrated on a single deliberate effect. They lack many of the features that writing classes recommend as good storytelling today – most are told in the first person, they are often a single scene with details of the background eliminated, while the narrators lacks even a name. Poe was an expert in the art of finding the perfectly suited adjectives that create nuances of mood and The Fall of the House of Usher is a masterpiece in this regard, where the house and surrounding landscape become a physical expression of despair and hopelessness that infects both the inhabitants and the house itself. Richard Matheson’s script makes some changes to the story. Madeleine is finally Roderick’s sister (having been changed to his wife in the two previous 1928 versions). The narrator finally gets a name Philip Winthrop – although he is not Roderick’s childhood friend but Madeleine’s fiancee. One of the problems with any version of The Fall of the House of Usher is that it is lacking in internal drama. Thus Richard Matheson needs to invent conflict – the narrator is now obsessed with taking Madeleine away from the house (Mark Damon gives a particularly cross and annoyed performance in the part), while Roderick is equally determined that she cannot leave and is doomed. This is also the first of the film adaptations to invent a backstory for the Usher line (something retained by most subsequent film adaptations). Thus the house becomes a manifestation of the crimes conducted by the ancestors and represents a physical evil that is seeping into their bones and is morally affecting the descendents. Roderick finally has his heightened over-acuteness of the senses, which makes for a fascinatingly original character – on the other hand, this is a trait that, after being introduced, has no subsequent relevance to the story (a problem also faced by Poe). Roger Corman never made any other of his Edgar Allan Poe films with the same successful balance of mood and design that he achieved here. 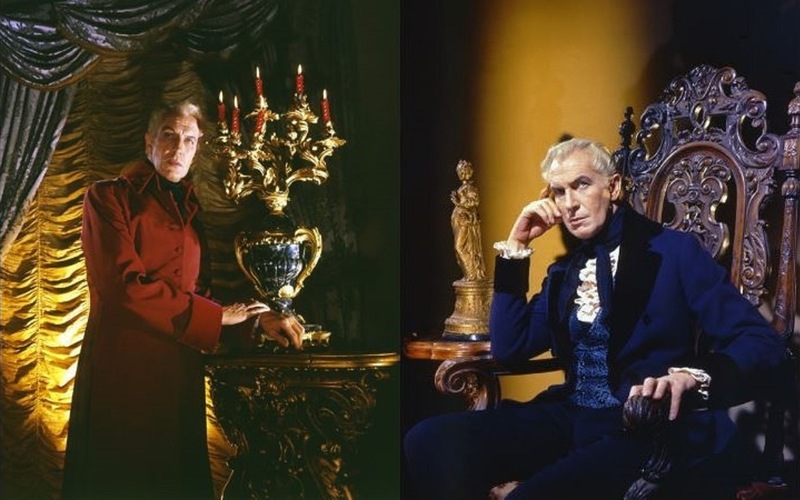 What Corman did was to undercut the floridness of Hammer Gothic with the moody intellectual angst of Ingmar Bergman – Corman was a great admirer of Bergman and you can see Bergman’s influence on his work, particularly in The Masque of the Red Death. It resulted in a form that achieved a level of moodily gloom-laden and thunderously overwrought melodrama. Corman accomplishes some nicely subtle effects at times but mostly The House of Usher succeeds on its own level of torturous angst – the climax with Vincent Price and the crazed Myrna Fahey fighting as the house burns around them and the house’s final descent to be swallowed up in the tarn is superlative. Vincent Price is persuaded to turn the usual hamminess of his acting towards a painfully anguished performance. In fact, it was this line in tortured, weak-livered aristocracy that made Vincent Price’s career for the next two decades. He is aided immensely by Richard Matheson’s nicely formal dialogue, which is perfect in describing his agonies. The other form of aid that Corman gets is from production designer Daniel Haller – the opening scenes as Mark Damon makes his way by horseback across a burned-out landscape of blackened, skeletal trees, scorched turf and billowing mist to the striking charcoal grey facade of the house is an unforgettable piece of mood setting. (Here Corman was opportunistically able to grab a camera and go out to the scene of a brush fire in the Hollywood Hills and use it as the blasted heath). Of all of the film versions of the story so far, we finally get a version of the Usher house that approximates what Poe described. Equally good are Bert Schoenberg’s briefly glimpsed, amazingly tortured paintings that stand in for portraits of the Usher family – in fact, they, like the entire film, give the impression of being the dramatic equivalent of an Edvard Munch painting. 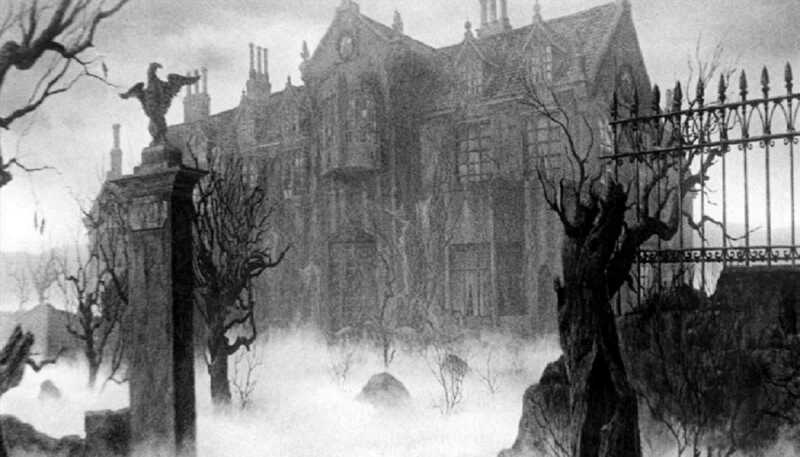 Other adaptations of the Edgar Allan Poe story are:– Jean Epstein’s French silent version The Fall of the House of Usher (1928); The Fall of the House of Usher (1928), a short silent British version; a dreary and not very faithful British version The Fall of the House of Usher (1949); the inept tv variation The Fall of the House of Usher (1979) with Martin Landau; Jesus Franco’s cheap The Fall of the House of Usher (1983) with Howard Vernon; Harry Alan Towers’ cheap The House of Usher (1989) with Oliver Reed; Ken Russell’s demented variation The Fall of the Louse of Usher (2002); the low-budget modernised The House of Usher (2006); David DeCoteau’s softcore gay House of Usher (2008); and as an episode of the animated anthology Extraordinary Tales (2015). The House of Usher was later directly spoofed in Elvira’s Haunted Hills (2001). Aside from the abovementioned Poe films, Roger Corman’s other genre films as director are:– Day the World Ended (1955), It Conquered the World (1956), War of the Satellites (1956), Attack of the Crab Monsters (1957), Not Of This Earth (1957), The Saga of the Viking Women and Their Journey to the Waters of the Great Sea Serpent (1957), The Undead (1957), Teenage Caveman (1958), A Bucket of Blood (1959), The Wasp Woman (1959), Last Woman on Earth (1960), The Little Shop of Horrors (1960), Creature from the Haunted Sea (1961), Tower of London (1962), The Terror (1963), X – The Man with X-Ray Eyes (1963), The Trip (1967), Gas; or It Became Necessary to Destroy the World in Order to Save It (1970) and Frankenstein Unbound (1990). Corman’s World: Exploits of a Hollywood Rebel (2011) is a documentary about Corman’s career. Corman has made over 300 film as producer, which are too numerous to list here. Richard Matheson has been a prolific genre screenwriter and novelist. His other genre works include The Incredible Shrinking Man (1957) based on his own novel, the Jules Verne adaptation Master of the World (1961), the occult film Night of the Eagle/Burn, Witch, Burn (1961), the Corman-produced mortician’s comedy The Comedy of Terrors (1963), The Last Man on Earth (1964) based on his novel I Am Legend (1954), the Hammer psycho-thriller The Fanatic/Die, Die, My Darling (1965), the classic Hammer occult film The Devil Rides Out/The Devil’s Bride (1968), the historical biopic De Sade (1969), Steven Spielberg’s first film Duel (1971), The Night Stalker (1972) and The Night Strangler (1973) tv movies, the haunted house film The Legend of Hell House (1973) from his novel, the tv adaptation of Dracula (1974), the tv movies Scream of the Wolf (1974), The Stranger Within (1974), Trilogy of Terror (1975), Dead of Night (1977) and The Strange Possession of Mrs. Oliver (1977), the tv mini-series adaptation of Ray Bradbury’s The Martian Chronicles (1980), the time travel romance Somewhere in Time (1980) from his own novel, Jaws 3-D (1983), Twilight Zone – The Movie (1983), and numerous classic episodes of The Twilight Zone, Thriller and Star Trek. Works based on his novels and stories are The Omega Man (1971) from his I Am Legend, What Dreams May Come (1998), Stir of Echoes (1999), I Am Legend (2007), The Box (2009) and Real Steel (2011). Star Mark Damon made a career as a leading man in Italy following The House of Usher and then in the 1980s returned to Hollywood where he became a producer with the likes of 9½ Weeks (1986), Short Circuit (1986), The Lost Boys (1987), The Jungle Book (1994), The Musketeer (2001) and Monster (2003), among many others. Production designer Daniel Haller later went onto become a director himself, making in particular two efforts Die, Monster, Die/Monster of Terror (1965) and The Dunwich Horror (1969) that adapt H.P. Lovecraft but draw upon the brooding, redolent style of Roger Corman’s Poe films.